Fourth WATSAN ‘Walk for Water’- Oxfordshire calling! The fourth WATSAN biennial ‘Walk for Water’ will take place on Saturday June 24th 2017 along a stretch of the Ridgeway, and passing through the very pretty spring-line villages to the north along a “figure of eight” route. The full distance will be around 23 miles, but, as in previous similar events, there will be at least three refreshment points where it will be possible to drop out, with transport provided. Also, for those who would like to join us for a shorter walk, there will be the opportunity to walk just half of the “figure of eight”, in company with the main group, to complete just 11 miles. We have booked Courthill Centre, Letcombe Regis near Wantage, Oxon from the evening of June 23rd until Sunday morning June 25th, for those who would like to spend the weekend with us, at a cost of £45 – £50 per head, full board, including a light lunch on Saturday. If more convenient for you, do feel free to join us just for the day. If you, and maybe friends or family, are seriously considering joining this group of WATSAN supporters, and participating in a spectacular trail through the Oxfordshire countryside, please email Ian and Ellie Bensted at bensted@easynet.co.uk and we will add you to the list of provisional takers, which already has at least a dozen or so on it! We will also need some non-walkers to join the Support Group who look after the rest of us! The previous three walks have raised in excess of £35,000 for the project. 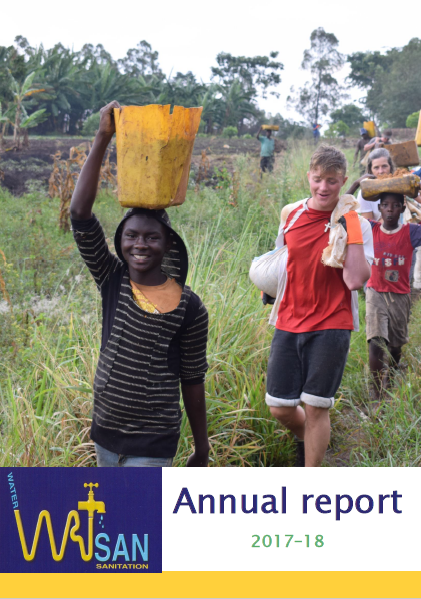 In 2011 our first walk enabled the acquisition of a new vehicle for the team in Uganda. By next year it is likely to be necessary to think about a replacement, as it receives a major hammering on the unsurfaced tracks in Uganda! Generous donations via the 2015 “Walk for Water” have enabled NKKD WATSAN to purchase a new motor-cycle for Charles Rwaminahe to carry out his vital work of identifying areas in immediate need of clean water. WATSAN’s eyes and ears in Kanungu District, Charles is constantly on the lookout for leaking or missing taps which may prevent people accessing clean water. Instead of relying on motor-cycle taxis (boda-bodas) Charles is thrilled that he now has his very own transport. He can now achieve so much more! 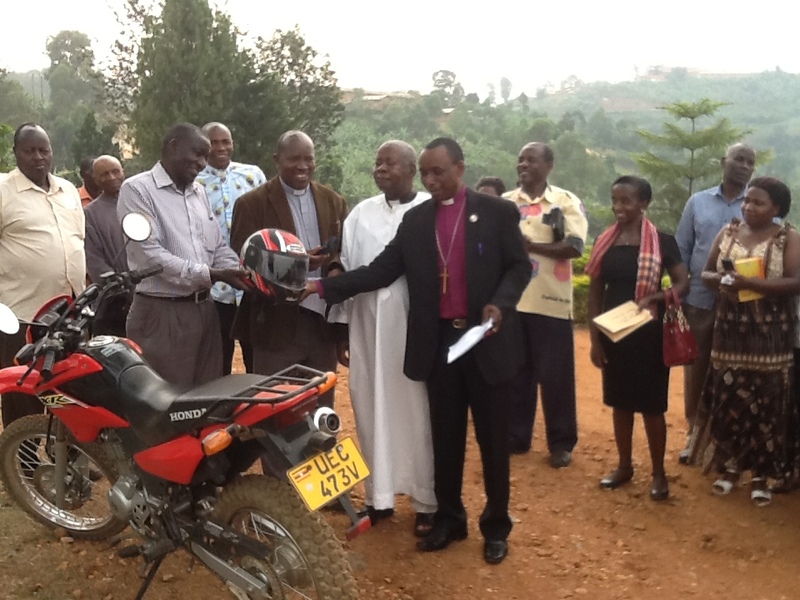 Here WATSAN Field Director, Canon Eric Baingana, and Bishop Dan Zoreka of Kinkiizi Diocese hand over the motor bike to Charles. Spend a Penny box exceeds all records! A WATSAN donor in Oxfordshire and visiting friends have filled her donor box to bursting, setting a new record of £41.13, smashing her previous record of £22.75, all collected while spending a penny! 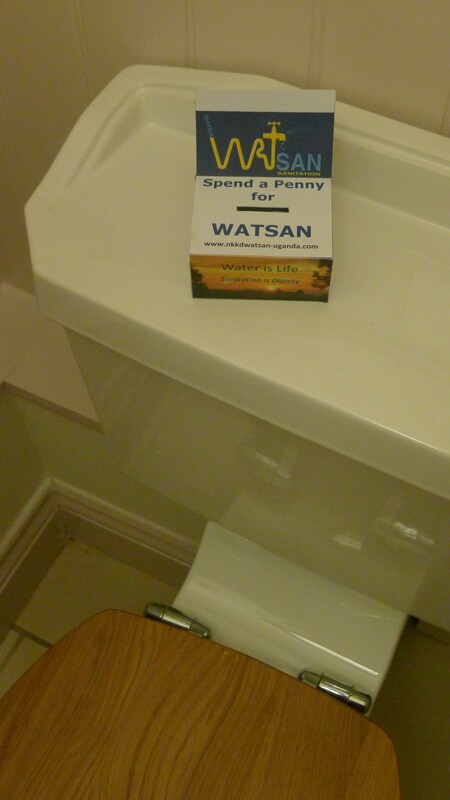 Many of our donors place our special WATSAN collecting boxes on their loos, reminding visitors of the desperate need for safe sanitation in Uganda. The custom-made boxes were designed by our treasurer Stephen Bullett and are painstakingly constructed by an 84-year-old gentleman, Brian Bartlett. If you would like a box, which can be sent flat-packed, please contact us.